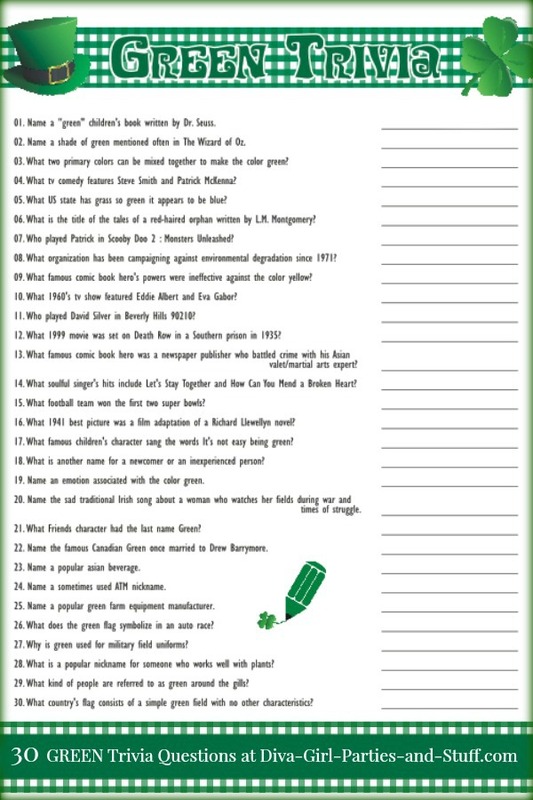 When planning a St. Patrick's day party or just a fun night of trivia, this list of green trivia questions will keep your guests thinking and reminiscing about all things green. 01. Name a "green" children's book written by Dr. Seuss. 02. Name a shade of green mentioned often in The Wizard of Oz. 03. What two primary colors can be mixed together to make the color green? 04. What tv comedy features Steve Smith and Patrick McKenna? 05. What US state has grass so green it appears to be blue? 06. What is the title of the tales of a red-haired orphan written by L.M. Montgomery? 07. Who played Patrick in Scooby Doo 2:Monsters Unleashed? 08. What organization has been campaigning against environmental degradation since 1971? 09. What famous comic book hero's powers were ineffective against the color yellow? 10. What 1960's tv show featured Eddie Albert and Eva Gabor? 11. Who played David Silver in Beverly Hills 90210? 12. What 1999 movie was set on Death Row in a Southern prison in 1935? 13. What famous comic book hero was a newspaper publisher who battled crime with his Asian valet/martial arts expert? 14. What soulful singer's hits include Let's Stay Together and How Can You Mend a Broken Heart? 15. What football team won the first two super bowls? 16. What 1941 best picture was a film adaptation of a Richard Llewellyn novel? 17. What famous children's character sang the words It's not easy being green? 18. What is another name for a newcomer or an inexperienced person? 19. Name an emotion associated with the color green. 20. Name the sad traditional Irish song about a woman who watches her fields during war and times of struggle. 21. What Friends character had the last name Green? 22. Name the famous Canadian Green once married to Drew Barrymore. 23. Name a popular asian beverage. 24. Name a sometimes used ATM nickname. 25. Name a popular green farm equipment manufacturer. 26. What does the green flag symbolize in an auto race? 27. Why is green used for military field uniforms? 28. What is a popular nickname for someone who works well with plants? 29. What kind of people are referred to as green around the gills? 30. What country's flag consists of a simple green field with no other characteristics?